Manager Bob Paisley (centre) is flanked by trainer Ronnie Moran (left) and assistant manager Joe Fagan. Former Liverpool captain, coach and caretaker manager Ronnie Moran has died at the age of 83. 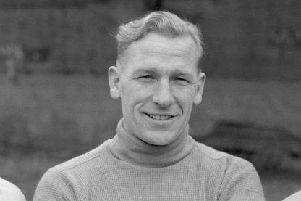 Moran made 379 appearances between 1952 and 1968, scoring 17 goals, but arguably played as big a role as part of Bill Shankly’s famous Boot Room. Having played for the Reds boss he was then invited by the Scot to join the coaching team and Moran twice filled in as caretaker manager during 49 years of service at the club. “Liverpool Football Club is deeply saddened by the passing of Ronnie Moran,” said a statement from the club. Born in Crosby, Moran’s playing career at Anfield began in 1949 when he joined as a part-timer while serving as an apprentice electrician and eventually signed professional forms for his home-town club shortly before his 18th birthday in January 1952, making his first-team debut the following November. He made the left-back position his own over the next decade or so, winning two league titles and the FA Cup before Shankly invited him onto his backroom team, although Moran continued playing for the reserves for a further two years before formally retiring from playing during the 1968-69 season. He guided the Reds’ reserve team to the Central League Championship in 1972-73 and became a valued member of the Boot Room, working under Shankly, Bob Paisley, Joe Fagan, Kenny Dalglish, Graeme Souness and Roy Evans. During that time he was twice called upon to become caretaker manager: once after Dalglish’s resignation in 1991 and when Souness was recovering from his triple by-pass heart surgery in 1992. He finally retired in 1998 and was rewarded with a testimonial match against Celtic in 2000. Moran remained a regular visitor to Anfield and was a familiar face at the club’s Melwood training ground during his daily jog around the field. Four years ago he was diagnosed with vascular dementia and last October his family took the difficult decision to admit him to a care home where he could receive 24-hour care. Former Liverpool manager Roy Evans said Ronnie Moran will be remembered “with great love and affection”. Evans, who worked alongside Moran for many years before including him in his coaching staff when he took over as manager, paid tribute to his former colleague. “It’s a sad end to a great man’s life,” Evans told BBC Radio Five Live. “He’s one of these guys that day in, day out, did his job and did a great job for Liverpool Football Club. “Liverpool and the fans will remember him for the great man that he was and he’ll be sadly missed. “I’m sure he will be remembered with great love and affection for what he did for our football club and it’s a sad time for us. Former Reds defender Phil Thompson, who wrote the foreword for Moran’s book ‘Mr Liverpool’ earlier this year, spoke fondly of his “mentor” and said the Merseyside club would not have won half the trophies they did without Moran. Liverpool won 13 league titles, five FA Cups and four European Cups - among other silverware - during Moran’s near-half-century with the club. “He was truly wonderful, inspirational, our guide,” Thompson said on Sky Sports News. “You’re saying ‘Ronnie’ but to us he’s known as ‘Bugsy’, his nickname. “Throughout all those times, those glory days, you needed somebody to keep the feet on the ground of all these superstars, and this guy was the man. Every day, he was the driving force. “Sometimes as a young man you’d think, ‘nothing satisfies this man’, but without him we would not have won half the trophies. This is not just a flippant comment - Bill Shankly, Bob Paisley... great. Ronnie Moran is up there with those two greats. Former midfielder Jamie Redknapp recalled Moran’s “bark” and how much it helped him learn. “He had a great heart, cared passionately about Liverpool Football Club and the players there,” the 43-year-old said on Sky Sports News. “He taught me everything in my early years at Liverpool and the traditions of how the game should be played. “He just had this bark. During training he’d shout at you, and I’d just think, ‘Why does he keep shouting at me? What’s his problem? “I remember saying to John Barnes one day, ‘Why does he keep picking on me?’ and he said, ‘He’s not picking on you - it’s because he likes you and he wants to make you better, and the day he stops either means he’s given up on you or he thinks you’re now a player. I hope it was the latter! “Young players now would be petrified of him because his bark was so loud. He had an amazing way of getting information across. You could hear him, no matter where you were on the pitch. “He always used to call me ‘Harry’. I’d say ‘My name’s Jamie’, but he always called me ‘Harry’. Even to this day, it makes me laugh.